A pair of Ray-Ban Rare Prints sunglasses from Mister Spex will really jazz up your life. 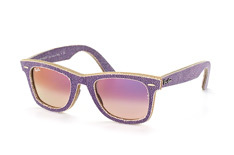 These sunglasses are cool and colourful: just the thing for holidays, trips to the beach, and parties. Pair them with your most eye catching outfit, or let them do the talking! Ray-Ban Rare Prints come in a variety of colours. Why not choose a shade that matches your eyes? Or, opt for a pair of sunglasses from the Ray-Ban Rare Prints range at Mister Spex that goes with your favourite dress or your best tie. These cool specs will certainly get you noticed, however, no matter what you wear with them. They combine an elegant designer shape with a real sense of fun, which makes them very appealing. When ordering sunglasses from Mister Spex, you can take advantage of a great range of features. All of our sunglasses lenses offer you great UV protection and scratch resistance too. We can offer prescription sunglasses as well, if you do not want the hassle of switching to contact lenses from glasses when the sun comes out. If you need extra scratch resistant coatings, that is also something that you can opt for here at Mister Spex.